Sua Nath is usually an amiable farmer. But ask him about mining in his village, Bagjana, and he flares up. Nath is among those who have taken it upon themselves to protect this village in Rajasthan's Bhilwara district from mining. The anti-mining movement has, in fact, struck roots in many villages in the district. "We will not allow anything to be taken from our land, be it rocks or gold," asserts Sua, while recollecting an incident when the villagers did not allow a former sarpanch to mine their almost barren grazing land. 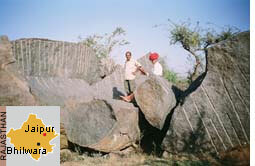 Erratic rainfall and thick granite deposits in Bagjana make agriculture a difficult proposition. So people raise livestock for a living, giving an added significance to grazing lands. About a year back, when a person in a neighbouring village leased out his private land to a miner, people didn't know much about mining. The person got Rs 1.5 lakh. Later, another person got Rs 1.75 lakh for leasing his land. And a mining lease for granite is given only for 3 hectares (ha) at a time. That's when people started to think of mining as a lucrative option. But things changed when the villagers discovered that Nathu Lal, a former sarpanch had applied for a mining lease on the grazing land. In January 2007, the villagers petitioned Bhilwara's district collector, and Lal was stopped from going ahead with mining. Mine field The plot in question had been enclosed by people in Bagjana two years ago with help of an ngo. Enclosing the land would help regenerate it, the people believed. The moved helped them defy the miners. Village land cannot be taken away for mining, if the villagers collectively enclose it. Besides mining leases on common grazing require a no-objection certificate (noc) from the panchyat. "But most often, either the noc turns out to be fake or the panchayat gives the certificate without consulting the village," says Ajitabh Sharma, collector and district magistrate, Bhilwara. Often, there is pressure from the miner lobby, he adds. Private land Opinion remains divided on mining on private land. Apart from being out of control of the villagers, it is also quite lucrative. Some villagers claim that they are waiting for land prices to rise. Nath also believes that Bagjana may allow mining on village land, if the benefits are shared evenly. But then he also says: "Even if we are compensated for land, the commons will be lost. I was offered Rs 74,000 for a bigha (about .25 ha), but I will not allow mining on my land." In neighbouring Gyangarh, Jai Singh Chundawat says "After mining for 20 years, not only is that one plot rendered barren but so are the adjacent pieces of land." "What is Rs 2 lakh? The poorer one is, the faster one finishes such quick money," says another resident of the village, Kamaal Singh. Narayan Gujjar adds, "No matter how infertile the land, it is always sufficient to provide enough fodder for goats to conceive twice a year. One will have to buy fodder if there are no commons." The pioneer Gyangarh has collectively disallowed mining even on private land. Here, a miner had carved out blocks for mining in 1995-96 in the village grazing land. But not many cared then. In 2004, the villagers enclosed the plot for regeneration with the help of an ngo. And when the miner came back in 2006, he was stopped dead in his tracks. The collector did not allow mining on the grounds that the villagers had enclosed the plot. The villagers had also been planning to enclose another patch of the commons for regeneration. But a month ago, they discovered pillars had been erected for a mining lease on the plot. The site is at a little distance from the village and the villagers did not realise when the pillars were being put up. "The patwari says that they are illegal (without an noc), but we know that it is easy to fool us. Even so, we are guarding the land", says Kamaal Singh. A source says, "The villagers managed to stop the miners once, but that may not be so in the long-term. Authorities keep changing." But Gujjar is confident. "In Khakrol (a village about 10 km away, in Rajsamand district), people managed to get mining stopped on revenue wasteland. We are only asking that our grazing lands be left free", he says.